Chorus60 is an emulation of a very famous vintage chorus found in an 80s iconic keyboard. When this particular keyboard was released it only had one oscillator per voice and to make the sound thicker the manufacturer used this particular kind of chorus that became the signature sound of many hits like “Sweet Dreams”. We took the original schematic, analyzed, simulated and recreated it in a plugin, and also added control for the internal chorus parameters like the LFO rate, Dry/Wet control and the chorus wideness. HoRNet HDS1 is a guitar distortion modeled after a famous pedal produced by a Japanese manufacturer since the latest seventies. The HoRNet VU Meter MK3 is a digital VU meter with auto gain staging and grouping functions, the new GUI comes straight from the 24th century and hides an intelligent tool that will improve your gain staging and mixing. Monitoring the strength of the signal coming into your DAW is crucial for a correct mixing, VU meter helps you both in recording and mixing stage. HoRNet SongKey MKII is a key detector, SongKey MKII works in real time analyzing a polyphonic audio stream (usually a song) and thanks to some advanced artificial intelligence algorithms identifies in which key the song is composed, SongKey MKII also tracks key changes during the song. What characterize Guitar Kit is that every one of the three modules is made of physical models. 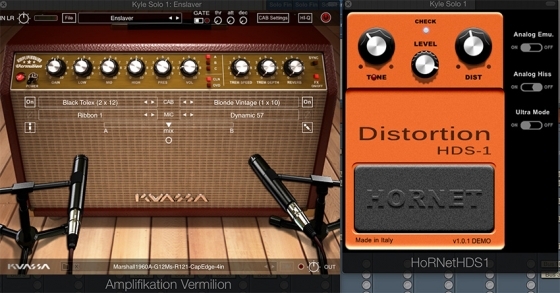 Many guitar amplifier simulators uses some sort of convolved impulse response in the signal path, while this allows to correctly emulate specific units, like specific guitar amp or cabinet, it greatly reduces the freedom you have in building your personal rig since every model is a static “picture” of the emulated unit.